Being able to observe a marine turtle in its habitat is an extraordinary experience. These animals have been here since the era of the dinosaurs – 110 million years- but currently all these species are in danger of extinction. So if we want them to be with us for any longer, we have to take their protection into serious consideration and take the following precautions. *don’t feed the animals. They are herbivore and an inadequate diet can affect their health. They could also become used to looking for food near boats and this could cause collisions and their death. If they become accustomed to eating fish they may end up swallowing hooks which can cause irreparable damage. More info on Respectful Diving here. Due to their excellent sense of direction, turtles always return to the same spot where they were born to lay their eggs. There are many farms where the eggs that are laid are taken to, in order to guarantee their safety when there is a possibility of damage or of being stolen. Nevertheless some of these farms are purely commercial enterprises at the expense of the turtles. If you want to be sure to visit a center with legitimate intentions visit the “Turle Farm” section in our web page. We have to be especially cautious not to acquire any souvenirs which are made from the skin or the shells of turtles. Although some are very obvious and labeled as “tortoishell” and “bekko”, other souvenirs (like the famous Indonesian puppets) use this material for the structure. Read more about souvenirs here. 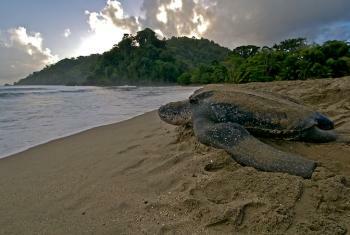 See this interesting and comprehensive report on turtles and the tourism industry.